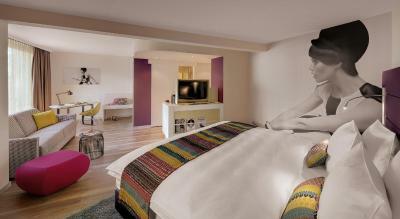 Lock in a great price for Hotel Indigo - Dusseldorf - Victoriaplatz – rated 9.1 by recent guests! Everything was great! Room is clean and well equipped. Great soundproofing. Nice garden. Good location. Hotel Indigo is a luxury hotel, with staff that welcomes you like family. In the two full weeks that we stayed here, we had not one complaint or difficulty. Our very quiet room was designed to feel like an efficiency apartment, and had a beautiful view of the terrace and gardens. 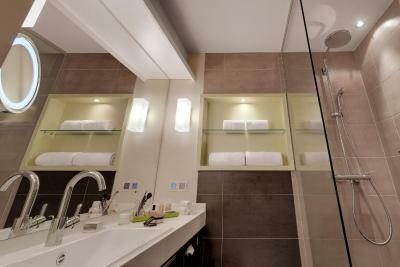 Loved the cosy bathrobes, rain style shower, heated tile floors, and lighted makeup/shaving mirror in the bathroom. There was a coffee maker and refrigerator, which was put to good use, when we got tired of going out to eat. All this, and the best staff I’ve ever encountered at a hotel. The entire Staff are very welcoming and accommodating. The Kitchen Staff are exceptional and Breakfast is outstanding! The Breakfast Chef and the Manager make sure everything is Perfect! The Hotel is Clean and newly upgraded! I would stay here every time I’m in Düsseldorf! Danke!!! The quite & convenient location, the interior design of the room, the (awesome!) breakfast, the friendly staff... basically, everything was awesome. One of my best hotel stays ever. Friendly accommodating staff. Cozy room with lovely colour scheme and room size is suitable for 1 to 2 pax. Located in a nice neighbourhood. Breakfast is generous and very tasty. The lady who cleaned my room is very kind. Very unique in the style of the hotel. Refreshing. Close to the U Bahn and walking distance to the Alt Stadt. The entire Staff is welcoming and professional. Breakfast is outstanding! (Kitchen manager is PERFECT) Upgraded room and it was beautiful. I would stay here again. Great location, great room and great staff! Would love to stay here again on my next trip. Hotel Indigo - Dusseldorf - Victoriaplatz This rating is a reflection of how the property compares to the industry standard when it comes to price, facilities and services available. It's based on a self-evaluation by the property. Use this rating to help choose your stay! This hotel in the Pempelfort district of Düsseldorf features free Wi-Fi, a spa area with a gym and saunas as well as a Mediterranean-style restaurant. The Messe Düsseldorf convention center and the Old Town are both an 8-minute subway ride from Hotel Indigo. The stylish air-conditioned rooms were renovated in 2013. They feature a flat-screen cable TV, a private bathroom and a minibar. Regional and international cuisine are served in the hotel's restaurant, where a buffet breakfast is also available. In summer months, drinks and meals can be enjoyed on the terrace. The Hofgarten Park and the Rhine River are less than half a mile from Hotel Indigo Düsseldorf and Nordstraße subway station is just 950 feet away. 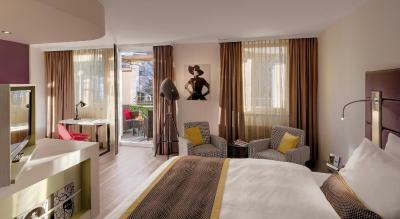 When would you like to stay at Hotel Indigo - Dusseldorf - Victoriaplatz? Public parking is available at a location nearby (reservation is not needed) and costs EUR 2 per hour. This double room has a electric kettle, garden view and air conditioning. Some of these rooms have a balcony and are assigned according to availability. This double room has a bathrobe, iPod dock and flat-screen TV. Some of these rooms have a balcony and are assigned according to availability. Fresh design, inspired service combined with our neighborhood. For our guests we are the place to discover something new and unique. For the locals that live nearby our hotels we're the place that's the most colorful, inviting and stylish. 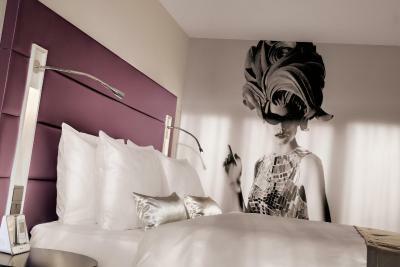 House Rules Hotel Indigo - Dusseldorf - Victoriaplatz takes special requests – add in the next step! Hotel Indigo - Dusseldorf - Victoriaplatz accepts these cards and reserves the right to temporarily hold an amount prior to arrival. No parking, but that’s typical in Germany. Also the mattress was way too soft. Very spacious room, apparently freshly renewed, and ultra comfy beds. Staff was very kind and helpful. Breakfast (included) was perfect, offering a wide range of products. And sauna and fitness room were definitely a + ! Neighborhood quite central and with plenty of shops / restaurants. 15 minutes walk from downtown, in what can be considered as a pleasant walk. Excellent price for the quality. Bad breakfast offer in the room. Adittional bottle of water cost 7€ in the bar! The lady who made the check out should get reprimanded for the bad customer's attitude. I was offended and not apologized when an mistake was made. Your stuff must to know that woman are booking the room the same as men and should not be ignored when they are with their husbad! A very comfortabe bed in the room (King size). A nice bathroom with bathtub. The internet was spotty, but otherwise, ok.
the employees tfrom breakfast are really intense.. they are a bit annoying.. they don´t give you space.. they ask you all the time if you want to drink something else and you are not even finish that they already remove your dirty dish.. they try so hard to be nice and at the end this turns on something negative. when i came they didnt know at all that I was coming and my room was not there.. I ask for a high floor they give me first the room on a first floor then they gave me a room on the 4th when I complaint. by check out they ask me to pay more money obwhol my booking was non refundable, they told me they make a mistake with the rate.. I denied to pay more and I ask them to clear the room rate directly by booking.com they where really unorganize on my opinion.. The bed was super comfortable; a fantastic night’s sleep. It was too loud, but I was located next to an staff elevator- which made my night pretty Bad. I recommend to everybody to pay visit in this specific hotel. Every detail was foreseen in order to make client's stay comfort. I travel to Dusseldorf for over three years. Is the first time that I visit Indigo and I'll never change again! Congratulation to all!! No hdmi cable or connection to view films via laptop on TV screen or Hdmi cable not available.